Ole Gunnar Solskjaer confirmed on Tuesday that Alexis Sanchez would return to action for Manchester United against Newcastle United at St James’s Park. The Chilean, who managed only four goals in 30 games under Jose Mourinho, last featured for Man United during an insipid 0-0 draw with Crystal Palace in November. Supporters will be keen to see how the 29-year-old performs in a red shirt now that the crushing weight of Mourinho’s dogmatism has been replaced by Solskjaer’s contagious optimism. 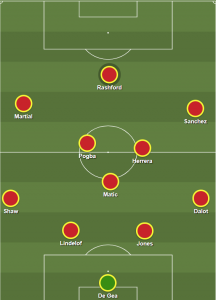 Here is how we think Man United will line for the meeting with Rafa Benitez’s side, which constitutes Solsklaer’s hardest game so far as caretaker manager. The sense of confidence and forward direction by Solskjaer is exemplified by how, all of a sudden, United’s starting XI appears much more obvious than it ever did under Mourinho. Some rotation will happen, of course. Diogo Dalot comes in for Ashley Young. Phil Jones steps in for the suspended Eric Bailly. Jesse Lingard, who struggled in front of goal against AFC Bournemouth, will surely make way for Sanchez, whose determination to impress will be sky high. Apart from that, though, the team writes itself. Same midfield. Same attacking duo of Marcus Rashford and Anthony Martial supported by Paul Pogba streaming forward. There is, bit by bit, an identity forming within this United team. That, to me, constitutes success in itself.